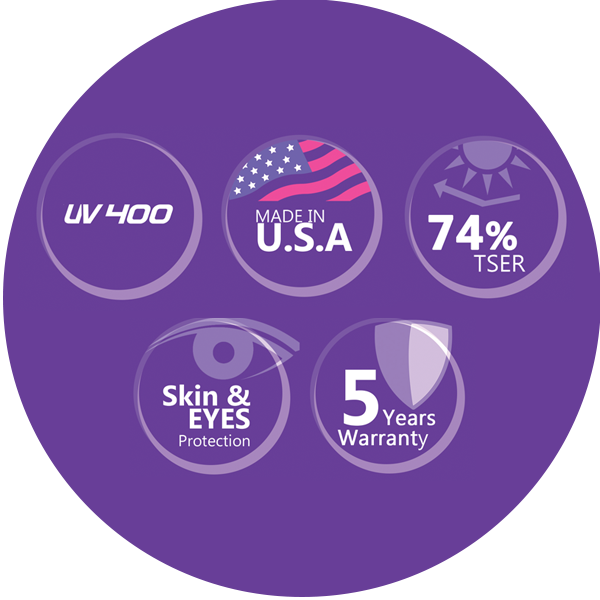 UV-400 Technology. Iceberg Window Films UV-400 Series is type of film with maximum protection to reject dangerous ultraviolet light up to 400 nm. Made in USA. Iceberg Window Films UV-400 Series is a nano technology produced in United States of America. 74% TSER. Rejecting total solar energy up to 74%. 5-Year Warranty. Iceberg Window Films UV-400 Series gives protection warranty for 5 years. Ultraviolet light we often call UV Light is divided into 3 categories namely UVA, UVB, and UVC lights. According to experts, the effects of ultraviolet lights in outdoor space will bring horrible impacts to our skin. UVA and UVB lights can damage our skin. The condition will worsen during summer when Earth is on equatorial line which occurs in our country, Indonesia. What is ultraviolet light radiation? UV light radiation is part of electromagnetic spectrum waves entering our Earth from sunlight. This UV light waves have shorter coverage than the visible light which makes this waves invisible to our eyes. These waves are classified into three categories namely UVA, UVB, and UVC as explained above. Commonly, UVC light is absorbed by ozone layer and does not reach the Earth. Meanwhile, UVA and UVB can enter Earth’s atmosphere and they can damage our skin and make it look older. UVA and UVB lights can harm cellular system in our body or skin leading to genetic mutation and skin cancer. UVA waves are longer than UVB and UVC. The waves of UVA light can reach 320-400 nanometer (nm) and its radiation can reach 95%. UVA light wave distance is 320-400nm. UVA light can penetrate ozone layer and reach Earth’s surface. The intensity of UVA light radiation is similar from time to time during entirely 1 year. UVA light has tremendous power that it can penetrate the clothes we are wearing, glasses, and small gaps. UVA light contributes to early aging and wrinkles on our skin as it can penetrate inner part of skin and damage the cells in our bodies. UVA light is also dominant and can cause black spots on skin. The black spot is caused by damage on our skin DNA. The risk of skin cancer gets higher up to 75% if a person is frequently exposed with UVA light in early age before they reach the age of 30 years old. In line with technological advance, the latest research reveals that radiation from UVA light greatly lowers body immunity cells leading to the growth of tumor cell. The distance of UVB light wave is 290-320 nm. UVB light is different depending on time and season. For the regions passed by equatorial like, UVB light has higher impact to damage skin’s epidermis layer. UVB light can also cause skin cancer, early aging and contributes to skin darkening. The distance of UVC light is 200-290 nm. This is the most dangerous light from the three but UVC light does not reach Earth’s surface as it is absorbed by ozone layer.